To evaluate the mortality rates for prostate cancer according to geographical areas in Peru between 2005 and 2014. Information was extracted from the Deceased Registry of the Peruvian Ministry of Health. We analysed age‐standardised mortality rates (world population) per 100 000 men. Spatial autocorrelation was determined according to the Moran Index. In addition, we used Cluster Map to explore relations between regions. Mortality rates increased from 20.9 (2005–2009) to 24.1 (2010–2014) per 100 000 men, an increase of 15.2%. 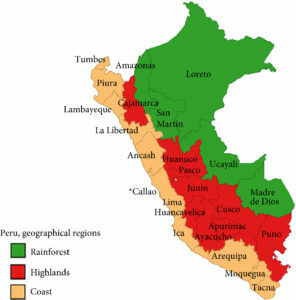 According to regions, during the period 2010–2014, the coast had the highest mortality rate (28.9 per 100 000), whilst the rainforest had the lowest (7.43 per 100 000). In addition, there was an increase in mortality in the coast and a decline in the rainforest over the period 2005–2014. The provinces with the highest mortality were Piura, Lambayeque, La Libertad, Callao, Lima, Ica, and Arequipa. Moreover, these provinces (except Arequipa) showed increasing trends during the years under study. The provinces with the lowest observed prostate cancer mortality rates were Loreto, Ucayali, and Madre de Dios. This study showed positive spatial autocorrelation (Moran’s I: 0.30, P= 0.01). Mortality rates from prostate cancer in Peru continue to increase. These rates are higher in the coastal region compared to those in the highlands or rainforest.